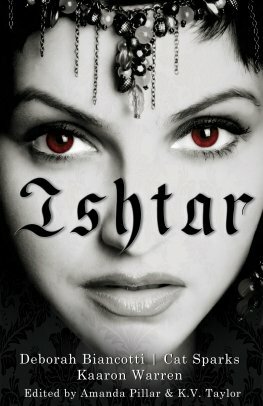 So when Ishtar, a collection of three novellas written by Kaaron Warren, Deborah Biancotti and Cat Sparks, and edited by Amanda Pillar and K V Taylor, was launched at Continuum 8 I was like a dog with two tails. I started reading on the plane home, diving into Kaaron’s “The Five Loves of Ishtar”, which is the tale of the goddess told by her washerwomen. There’s a lovely authentic feel to this story, and a voice (or series of voices) that echoes the oral tradition, and you can really sense the parallels with myths like the Epic of Gilgamesh; the resonances are strong. Deb’s modern day tale “And the Dead Shall Outnumber the Living” is a detective story set in Sydney and is filled with the usual lightning crack of her wit. Honestly, you can smell the ozone. I think this one gave me the most nightmares. Well done, Deb! Cat’s post-apocalyptic goddess is amazing and lost and terrible and wonderful and all manner of other words of a complimentary shade. The landscape is believably ravaged as are the souls of the folk who inhabit it. And reigning over it all is Dr Anna. The book is kind of mosaic in structure, presenting different views of the goddess and yet sequential over time, so read the stories in order as they progress from the ancient to the post-apocalyptic. This is a wonderful blending of voices and talents and all involved can be justifiably proud of the finished product. This entry was posted in News, Pimping/Promoting! and tagged amanda pillar, cat sparks, Deborah Biancotti, gilgamesh press, ishtar, k v taylor, kaaron warren. Bookmark the permalink.